Oium, Dacia, Pannonia, Dalmatia, Italy, Gallia Narbonensis, Gallia Aquitania, Hispania, Crimea. Gothic is an extinct Germanic language that was spoken by the Goths. It is known primarily from the Codex Argenteus, a 6th-century copy of a 4th-century Bible translation, and is the only East Germanic language with a sizable text corpus. All others, including Burgundian and Vandalic, are known, if at all, only from proper names that survived in historical accounts, and from loanwords in other languages such as Portuguese, Spanish and French. As a Germanic language, Gothic is a part of the Indo-European language family. It is the earliest Germanic language that is attested in any sizable texts, but it lacks any modern descendants. The oldest documents in Gothic date back to the 4th century. The language was in decline by the mid-6th century, partly because of the military defeat of the Goths at the hands of the Franks, the elimination of the Goths in Italy and geographic isolation (in Spain the Gothic language lost its last and probably already declining function as a church language when the Visigoths converted to Catholicism in 589). The language survived as a domestic language in the Iberian peninsula (modern Spain and Portugal) as late as the 8th century and, in the lower Danube area and in isolated mountain regions in Crimea, apparently as late as the early 9th century. Gothic-seeming terms found in later (post-9th century) manuscripts may or may not belong to the same language. Codex Argenteus (Uppsala), including the Speyer fragment: 188 leaves. The best-preserved Gothic manuscript. Dating from the 6th century, it was preserved and transmitted by northern Ostrogoths in modern Italy. It contains a large part of the four Gospels. 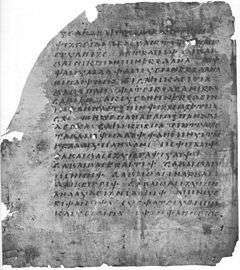 Since it is a translation from Greek, the language of the Codex Argenteus is replete with borrowed Greek words and Greek usages. The syntax in particular is often copied directly from the Greek. Codex Ambrosianus (Milan) and the Codex Taurinensis (Turin): Five parts, totaling 193 leaves. It contains scattered passages from the New Testament (including parts of the Gospels and the Epistles), of the Old Testament (Nehemiah), and some commentaries known as Skeireins. It is, therefore, likely that the text had been somewhat modified by copyists. Codex Gissensis (Gießen): 1 leaf, fragments of Luke 23–24. It was found in Egypt in 1907 and was destroyed by water damage in 1945. Codex Carolinus (Wolfenbüttel): 4 leaves, fragments of Romans 11–15. A scattering of old documents: alphabets, calendars, glosses found in a number of manuscripts and a few runic inscriptions (between 3 and 13) that are known or suspected to be Gothic. Some scholars believe that these inscriptions are not at all Gothic. Several names in an Indian inscription were thought to be possibly Gothic by Krause. A small dictionary of more than eighty words and a song without translation, compiled by the Fleming Ogier Ghiselin de Busbecq, the Habsburg ambassador to the court of the Ottoman Empire in Istanbul from 1555 to 1562, who was curious to find out about the language and by arrangement met two speakers of Crimean Gothic and listed the terms in his compilation Turkish Letters. These terms date from nearly a millennium later than Ulfilas and are therefore not representative of his language. Busbecq's material also contains many puzzles and enigmas and is difficult to interpret in the light of comparative Germanic linguistics. Only fragments of the Gothic translation of the Bible have been preserved. The translation was apparently done in the Balkans region by people in close contact with Greek Christian culture. It appears that the Gothic Bible was used by the Visigoths in Iberia until about 700 AD, and perhaps for a time in Italy, the Balkans and what is now Ukraine. In exterminating Arianism, many texts in Gothic were probably expunged and overwritten as palimpsests or collected and burned. Apart from Biblical texts, the only substantial Gothic document that still exists and the only lengthy text known to have been composed originally in the Gothic language, is the Skeireins, a few pages of commentary on the Gospel of John. Very few secondary sources make reference to the Gothic language after about 800. In De incrementis ecclesiae Christianae (840/2), Walafrid Strabo, a Frankish monk who lived in Swabia, speaks of a group of monks, who reported that "even now certain peoples in Scythia (Dobrudja), especially around Tomis spoke a sermo Theotiscus ('Germanic language'), the language of the Gothic translation of the Bible, and they used such a liturgy. In evaluating medieval texts that mention the Goths, many writers used the word Goths to mean any Germanic people in eastern Europe (such as the Varangians), many of whom certainly did not use the Gothic language as known from the Gothic Bible. Some writers even referred to Slavic-speaking people as Goths. However, it is clear from Ulfilas' translation that despite some puzzles the language belongs with the Germanic language group, not with Slavonic. This Gothic alphabet has nothing to do either with blackletter (also called Gothic script), which was used to write the Latin script from the 12th to 14th centuries and evolved into the Fraktur writing later used to write German or with the sans-serif type fonts sometimes called "Gothic". A standardized system is used for transliterating Gothic words into the Latin script. The system mirrors the conventions of the native alphabet, such as writing long /iː/ as ei. There are two variant spelling systems: a "raw" one that directly transliterates the original Gothic script and a "normalized" one that adds diacritics (macrons and acute accents) to certain vowels to clarify the pronunciation or, in certain cases, to indicate the Proto-Germanic origin of the vowel in question. The latter system is usually used in the academic literature. áu is used for the sound derived from Common Germanic diphthong au. It cannot be related to a Greek digraph, since αυ then represented a sequence of vowel+spiral (fricative) consonant, which Ulfilas transcribed as (aw in "normalised transcription") in representing Greek words. Nevertheless, the argument based on simplicity is accepted by some influential scholars. Paradigmatic alterations can occur either intra-paradigm (between two different forms within a specific paradigm) or cross-paradigm (between the same form in two different paradigms of the same class). Examples of intra-paradigm alternation are gawi /ɡa.wi/ "district (nom.)" vs. gáujis /ɡɔː.jis/ "district (gen.)"; mawi /ma.wi/ "maiden (nom.)" vs. máujōs /mɔː.joːs/ "maiden (gen.)"; þiwi /θi.wi/ "maiden (nom.)" vs. þiujōs /θiu.joːs/ "maiden (gen.)"; taui /tɔː.i/ "deed (nom.)" vs. tōjis /toː.jis/ "deed (gen.)"; náus /nɔːs/ "corpse (nom.)" vs. naweis /na.wiːs/ "corpses (nom. )"; triu /triu/?? "tree (nom.)" vs. triwis /tri.wis/ "tree (gen.)"; táujan /tɔː.jan/ "to do" vs. tawida /ta.wi.ða/ "I/he did"; stōjan /stoː.jan/ "to judge" vs. stauida /stɔː.i.ða/ "I/he judged". Examples of cross-paradigm alternation are Class IV verbs qiman /kʷiman/ "to come" vs. baíran /bɛran/ "to carry", qumans /kʷumans/ "(having) come" vs. baúrans /bɔrans/ "(having) carried"; Class VIIb verbs lētan /leː.tan/ "to let" vs. saian /sɛː.an/ "to sow" (note similar preterites laílōt /lɛ.loːt/ "I/he let", saísō /sɛ.soː/ "I/he sowed"). A combination of intra- and cross-paradigm alternation occurs in Class V sniwan /sni.wan/ "to hasten" vs. snáu /snɔː/ "I/he hastened" (expected *snaw, cf. qiman "to come", qam "I/he came"). Macrons represent long ā and ū (however, long i appears as ei, following the representation used in the native alphabet). Macrons are often also used in the case of ē and ō; however, they are sometimes omitted since these vowels are always long. Long ā occurs only before the consonants /h/, /hʷ/ and represents Proto-Germanic nasalized /ãː(h)/ < earlier /aŋ(h)/, still non-nasal /aː/ did not occur in Proto-Germanic. It is possible that the Gothic vowel still preserved the nasalization. Non-nasal /iː/ and /uː/ occurred in Proto-Germanic, however and so long ei and ū occur in all contexts. Before /h/ and /hʷ/, long ei and ū could stem from either non-nasal or nasal long vowels in Proto-Germanic; it is possible that the nasalization was still preserved in Gothc but not written. Although [ŋ] is the allophone of /n/ occurring before /a/ and /k/, it is written g, following the native alphabet convention (which, in turn, follows Greek usage), which leads to occasional ambiguities, e.g. saggws [saŋɡʷs] "song" but triggws [triɡɡʷs] "faithful" (cf. English "true"). /a/, /i/ and /u/ can be either long or short. Gothic writing distinguishes between long and short vowels only for /i/ by writing i for the short form and ei for the long (a digraph or false diphthong), in an imitation of Greek usage (ει = /iː/). Single vowels are sometimes long where a historically present nasal consonant has been dropped in front of an /h/ (a case of compensatory lengthening). Thus, the preterite of the verb briggan [briŋɡan] "to bring" (English bring, Dutch brengen, German bringen) becomes brahta [braːxta] (English brought, Dutch bracht, German brachte), from the proto-Germanic *braŋk-dē. In detailed transliteration, when the intent is more phonetic transcription, length is noted by a macron (or failing that, often a circumflex): brāhta, brâhta. This is the only context in which /aː/ appears natively whereas /uː/ is found often enough in other contexts: brūks "useful" (Dutch gebruik, German Gebrauch, Icelandic brúk "use"). The Germanic diphthongs /ai/ and /au/ appear as digraphs written ⟨ai⟩ and ⟨au⟩ in Gothic. Researchers have disagreed over whether they were still pronounced as diphthongs /ai/ and /au/ in Ulfilas's time (4th century AD) or had become long open-mid vowels: /ɛː/ and /ɔː/: ains [ains] / [ɛːns] "one" (German eins, Icelandic einn), augo [auɣoː] / [ɔːɣoː] "eye" (German Auge, Icelandic auga). It is most likely that the latter view is correct, but as it is indisputable that the digraphs ⟨ai⟩ and ⟨au⟩ represent the sounds /ɛː/ and /ɔː/ in some circumstances (see below), and the ⟨aj⟩ and ⟨aw⟩ were available to clearly represent the sounds /ai/ and /au/. Furthermore, the digraph ⟨aw⟩ is in fact used to represent /au/ in foreign words (such as Pawlus "Paul"), and alternations between ⟨ai⟩/⟨aj⟩ and ⟨au⟩/⟨aw⟩ are scrupulously maintained in paradigms were both variants occur (e.g. taujan "to do" vs. past tense tawida "did"). Evidence from transcriptions of Gothic names into Latin suggests that the sound change had occurred very recently when Gothic spelling was standardized: Gothic names with Germanic au are rendered with au in Latin until the 4th century and o later on (Austrogoti > Ostrogoti). The digraphs ⟨ai⟩ and ⟨au⟩ are normally written with an accent on the first vowel (ái, áu) when they correspond to Germanic /ai/ and /au/. Long [ɛː] and [ɔː] also occur as allophones of /eː/ and /uː, oː/ respectively before a following vowel: waian [wɛːan] "to blow" (Dutch waaien, German wehen), bauan [bɔːan] "to build" (Dutch bouwen, German "bauen", Icelandic búa "to live, reside"), also in Greek words Trauada "Troad" (Gk. Τρῳάς). /y/ (pronounced like German ü and French u) is a Greek sound used only in borrowed words. It is transliterated as w in vowel positions: azwmus [azymus] "unleavened bread" ( < Gk. ἄζυμος). It represents an υ (y) or the diphthong οι (oi) in Greek, both of which were pronounced [y] in period Greek. Since the sound was foreign to Gothic, it was perhaps pronounced [i]. /iu/ is a descending diphthong ([iu̯] or [i̯u]: diups [diu̯ps] "deep" (Dutch diep, German tief, Icelandic djúpur). Greek diphthongs: In Ulfilas's era, all the diphthongs of Classical Greek had become simple vowels in speech (monophthongization), except for αυ (au) and ευ (eu), which were probably still pronounced [aβ] and [ɛβ]. (They evolved into [av/af] and [ev/ef] in Modern Greek.) Ulfilas notes them, in words borrowed from Greek, as aw and aiw, probably pronounced [au, ɛu]: Pawlus [paulus] "Paul" (Gk. Παῦλος), aíwaggelista [ɛwaŋɡeːlista] "evangelist" (Gk. εὐαγγελιστής, via the Latin evangelista). Simple vowels and diphthongs (original and spurious ones) can be followed by a [w], which was likely pronounced as the second element of a diphthong with roughly the sound of [u]. It seems likely that this is more of an instance of phonetic coalescence than of phonological diphthongs (such as, for example, the sound /aj/ in the French word paille ("straw"), which is not the diphthong /ai/ but rather a vowel followed by an approximant): alew [aleːw] "olive oil" ( < Latin oleum), snáiws [snɛːws] ("snow"), lasiws [lasiws] "tired" (English lazy). The voiceless stops /p/, /t/ and /k/ are regularly noted by p, t and k respectively: paska [paska] "Easter" (from the Greek πάσχα), tuggo [tuŋɡoː] "tongue", kalbo [kalboː] "calf". The stops probably had (nonphonemic) aspiration like in most modern Germanic languages: [pʰ, tʰ, kʰ]. /s/ and /z/ are usually written s and z. The latter corresponds to Germanic *z (which has become r or silent in the other Germanic languages); at the end of a word, it is regularly devoiced to s. E.g. saíhs [sɛhs] "six", máiza [mɛːza] "greater" (English more, Dutch meer, German mehr, Icelandic meira) ~ máis [mɛːs] "more, rather". /h/ is written as h: haban "to have". It was probably pronounced [h] in word-final position and before a consonant as well (not [x], since /a/ > [x] is written g, not h): jah [jah] "and" (Dutch, German, Scandinavian ja "yes"). [x] is an allophone of /a/ at the end of a word or before a voiceless consonant; it is always written g: dags [daxs] "day" (German Tag). In some borrowed Greek words is the special letter x, which represents the Greek letter χ (ch): Xristus [xristus] "Christ" (Gk. Χριστός). It may also have signified a /k/. [β], [ð] and [ɣ] are voiced fricative found only in between vowels. They are allophones of /b/, /d/ and /a/ and are not distinguished from them in writing. [β] may have become /v/, a more stable labiodental form (a case of fortition). In the study of Germanic languages, these phonemes are usually transcribed as ƀ, đ and ǥ respectively: haban [haβan] "to have", þiuda [θiu̯ða] "people" (Dutch Diets, German Deutsch, Icelandic þjóð > English Dutch), áugo [auɣoː] "eye" (English eye, Dutch oog, German Auge, Icelandic auga). When occurring after a vowel at the end of a word or before a voiceless consonant, these sounds become unvoiced [x], [θ] and [x], e.g. hláifs [hlɛːɸs] "loaf" but genitive hláibis [hlɛːβis] "of a loaf", plural hláibōs [hlɛːβoːs] "loaves". ƕ (also transcribed hw) is the labiovelar equivalent of /ɸ/, derived from Proto-Indo-European *kʷ. It was probably pronounced [ʍ] (a voiceless [w]), as wh is pronounced in certain dialects of English and in Scots: ƕan /ʍan/ "when", ƕar /ʍar/ "where", ƕeits [ʍiːts] "white". /l/, /m/, /n/ and /r/ may occur either between two other consonants of lower sonority or word-finally after a consonant of lower sonority. It is probabe that the sounds are pronounced partly or completely as syllabic consonants in such circumstances (as in English "bottle" or "bottom": tagl [taɣl̩] or [taɣl] "hair" (English tail, Icelandic tagl), máiþms [mɛːθm̩s] or [mɛːθms] "gift", táikns [tɛːkn̩s] or [tɛːkns] "sign" (English token, Dutch teken, German Zeichen, Icelandic tákn) and tagr [taɣr̩] or [taɣr] "tear (as in crying)". Accentuation in Gothic can be reconstructed through phonetic comparison, Grimm's law and Verner's law. Gothic used a stress accent rather than the pitch accent of Proto-Indo-European. It is indicated by the fact that long vowels [eː] and [oː] were shortened and the short vowels [a] and [i] were lost in unstressed final syllables. Non-compound words: marka [ˈmarka] "border, borderlands" (English "march" as in the Spanish Marches; Dutch mark); aftra [ˈaftra] "after"; bidjan [ˈbidjan] "pray" (Dutch, bidden, German bitten, Icelandic biðja, English bid). Noun second element: guda-láus [ˈɡuðalɔːs] "godless". Nouns can be divided into numerous declensions according to the form of the stem: a, ō, i, u, an, ōn, ein, r, etc. Adjectives have two variants, indefinite and definite (sometimes indeterminate and determinate), with definite adjectives normally used in combination with the definite determiners (such as the definite article sa/þata/sō) while indefinite adjectives are used in other circumstances. Indefinite adjectives generally use a combination of a-stem and ō-stem endings, and definite adjectives use a combination of an-stem and ōn-stem endings. The concept of "strong" and "weak" declensions that is prevalent in the grammar of many other Germanic languages is less significant in Gothic because of its conservative nature: the so-called "weak" declensions (those ending in n) are, in fact, no weaker in Gothic (in terms of having fewer endings) than the "strong" declensions (those ending in a vowel), and the "strong" declensions do not form a coherent class that can be clearly distinguished from the "weak" declensions. The interrogative pronouns begin with ƕ-, which derives from the proto-Indo-European consonant *kʷ that was present at the beginning of all interrogratives in proto-Indo-European. That is cognate with the wh- at the beginning of many English interrogative, which, as in Gothic, are pronounced with [ʍ] in some dialects. The same etymology is present in the interrogatives of many other Indo-European languages": w- [v] in German, hv- in Danish, the Latin qu- (which persists in modern Romance languages), the Greek τ or π, the Slavic and Indic k- as well as many others. Icelandic: infinitive: gefa, preterite: gaf. The syntax of Gothic is similar to that of other old Germanic languages such as Old English and Old Norse. The word order of Gothic is fairly free like that of other heavily inflected languages with several noun cases. The natural word order of Gothic is assumed to have been like that of the other old Germanic languages (essentially similar to Modern German word order); however, nearly all extant Gothic texts are translations of Greek originals and have been heavily influenced by Greek syntax. 2 Timothy 3:12 (they will suffer persecution) was translated as wrakos wrikkand (persecutions, object - they suffer, verb). The object is put in front of the verb, which happened in other verses that are not similar to the Greek. Matthew 27:5 was translated as Ushaihah sik (hanged, verb - himself, object). An important and archaic feature of Gothic, missing from all other Germanic languages, is the presence of various clitic particles placed in the second position in a sentence, in accordance with Wackernagel's Law; for example, ab-u þus silbin "of thyself?" has -u as a clitic indicating that a yes/no question is being asked, and the clitic is attached to the first word of the clause like -ne in Latin. It should be noted that the prepositional phrase without the clitic appears as af þus silbin: the clitic causes the reversion of originally voiced fricatives, unvoiced at the end of a word, to their voiced form; another such example is wileid-u "do you (pl.) want" from wileiþ "you (pl.) want". If the first word has a preverb attached, the clitic actually splits the preverb from the verb: ga-u-láubjats "do you both believe...?" from galáubjats "you both believe". Another such clitic is -uh "and", appearing as -h after a vowel: ga-h-mēlida "and he wrote" from gamēlida "he wrote", urreis nim-uh "arise and take!" from the imperative form nim "take". More than one such clitics can occur: diz-uh-þan-sat ijōs "and then he seized them (fem.)" from dissat "he seized" (notice again the voicing of diz-), ga-u-ƕa-sēƕi "whether he saw anything" from gasēƕi "he saw". Most conspicuously, Gothic shows no sign of morphological umlaut. Gothic fotus, pl. fotjus, can be contrasted with English foot : feet, German Fuß : Füße, Old Icelandic fótr : fœtr, Danish fod : fødder. These forms contain the characteristic change /o:/ > /ø:/ (> Eng. /i:/, Germ. /y:/) due to i-umlaut; the Gothic form shows no such change. The morphological passive in North Germanic languages (Swedish gör "does", görs "is done") originates from the Old Norse middle voice rather than from Indo-European. Polish linguist Witold Mańczak had argued that Gothic is closer German than to Scandinavian and suggests that their ancestral homeland was located southernmost part of the Germanic territories, close to present day Austria rather than in Scandinavia. Frederik Kortlandt has agreed with Mańczak's hypothesis, stating: "I think that his argument is correct and that it is time to abandon Iordanes' classic view that the Goths came from Scandinavia." Tolkien's use of Gothic is also known from a letter from 1965 to Zillah Sherring. When she bought a copy of Thucydides' History of the Peloponnesian War in Salisbury, she found strange inscriptions in it; after she found his name in it, she wrote him a letter and asked him if the inscriptions were his, including the longest one on the back, which was in Gothic. In his reply to her he corrected some of the mistakes in the text; he wrote for example that hundai should be hunda and þizo boko (of those books), which he suggested should be þizos bokos (of this book). A semantic inaccuracy of the text which he mentioned himself is the use of lisan for read, while this was ussiggwan. Tolkien also made a calque of his own name in Gothic in the letter, which according to him should be Ruginwaldus Dwalakoneis. ↑ Hammarström, Harald; Forkel, Robert; Haspelmath, Martin; Bank, Sebastian, eds. (2016). "Gothic". Glottolog 2.7. Jena: Max Planck Institute for the Science of Human History. ↑ Krause, Wolfgang. Handbuch des Gotischen. Niemeyer. ↑ Alice L. Harting-Correa, "Walahfrid Strabo's libellus de exordiis et incrementis quarundam in observationibus ecclesiasticis rerum. A translation and liturgical commentary", Leiden-New York-Köln: Brill, 1996 (ISBN 90 04 09669 8), pp. 72–73. Discussion between W. Haubrichs and S. Barnish in D. H. Green (2007), "Linguistic and Literary Traces of the Ostrogoths", The Ostrogoths from the Migration Period to the Sixth Century: An Ethnographic Perspective, Sam J. Barnish and Federico Marazzi, eds., part of Studies in Historical Archaeoethnology, Volume 7, Giorgio Ausenda, series ed. (Oxford: Boydell Press, ISBN 978-1-84383-074-0. ), p. 409 and n1. ↑ See also Cercignani, Fausto (1986). "The Development of the Gothic Vocalic System". In Brogyanyi, Bela; Krömmelbein, Thomas. 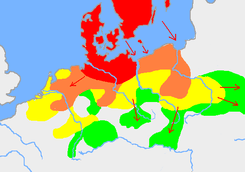 Germanic Dialects: Linguistic and Philological Investigations. Amsterdam and Philadelphia: Benjamins. pp. 121–151. ISBN 90-272-3526-0. ↑ For the Gothic short vowels see also Cercignani, Fausto (1979). "The Development of the Gothic Short/Lax Subsystem". Zeitschrift für vergleichende Sprachforschung. 93 (2): 272–278. ↑ But see Cercignani, Fausto (1984). "The Enfants Terribles of Gothic "Breaking": hiri, aiþþau, etc.". The Journal of Indo-European Studies. 12 (3-4): 315–344. ↑ See also Cercignani, Fausto (1979). "The Reduplicating Syllable and Internal Open Juncture in Gothic". Zeitschrift für vergleichende Sprachforschung. 93 (1): 126–132. ↑ Roger, D. Woodward (2008). The ancient languages of Europe. Cambridge University Press. p. 213. ISBN 0521684951. ↑ Voyles, J. B. (1992). Early Germanic Grammar. San Diego: Academic Press. pp. 25–26. ISBN 0-12-728270-X. ↑ Kortlandt, "The origin of the Goths"
↑ Holzer, Georg (1990). "Germanische Lehnwörter im Urslavischen: Methodologisches zu ihrer Identifizierung" [Germanic word-borrowings in proto-slavic: towards a methodology of their identiification]. Croatica, Slavica, Indoeuropaea (in German). Verlag der Österreichischen Akademie der Wissenschaften. 8 (Ergänzungsband): 59–67. ISBN 9783700117742. Retrieved 2014-01-07. ↑ Shippey, Tom. The road to Middle-earth: Revised and Expanded edition. Houghton Mifflin Company. p. 26. ISBN 0-618-25760-8. ↑ Bellet, Bertrand; Babut, Benjamin. "Apostil to Thucydides". Glæmscrafu. ↑ Massmann, Hans Ferdinand. "Thunravalds Sunau". Thorvaldsen museum. ↑ Simmelkjær Hansen, Bjarne. "qimandau triggwai" (PDF). Roots of Europe.